My Cousin Rachel (1952) Doubleday & Co.
Rachel, a woman of exquisite beauty, descends on the great Cornwall estate of Philip Ashley. Despite his aroused suspicions, she soon enchants him. In this tale of good and evil, Philip must decide whether the glorious Rachel, the recent mysterious widow of his beloved cousin, is out to destroy him or is the innocent victim of devious man with a tremendous longing to be loved. His fate and his future lie in the answer to this deadly question. This book has been sitting unread on my shelves for years - ever since I saw a theatre adaptation in my early teens - and I have no idea why. Since it was plucked down off the shelves it seems to have taken forever to plough through - and I have no idea why! This is du Maurier at her best: a gloomy house filled with the bitter secrets of an enigmatic woman; the briny scent of the Cornish sea air; a tormented man seeking love... Oh, wait, does this sound familiar? Perhaps that's one of the reasons it took me so long to read it - although it's beautifully written and completely brilliant, it is basically a not-quite-as-good version of Rebecca. Where Rebecca was impossible to put down, sent chills down the reader's spine and was deeply rooted on the Cornish coast, My Cousin Rachel takes longer to work up to its denouement, invites more questioning and pondering from the steady reader, and spreads its wings to encompass a good dose of Italian influence. It is narrated, not by an innocent damsel, but by young Philip Ashley, who inherits a sizeable estate when his beloved cousin Ambrose dies during an extended stay in Italy. In his feverish letters to Philip prior to his death, he implicates his new wife - Philip's cousin Rachel - in his illness. So when Rachel arrives in England to visit the estate and her young cousin, Philip expects a black widow and is completely unprepared for how he feels as he gets to know this beautiful, exotic woman. But all may not be as it seems, and Philip is determined to find out the truth once and for all before he becomes a victim in turn. As always, du Maurier excels at making the reader question their assumptions every step of the way with her spectacular use of the unreliable narrator. Who is the predator, and who the prey? Is Philip's mind twisting events out of shape, or are his perceptions going to turn out to be correct? What really happened in Italy, and who can we trust to be telling the truth - or are Rachel and Philip both too enmeshed in the situation to think and speak honestly? There is also a wealth of very pointed social observation about national stereotypes and the role of women. Philip, living before the delights of cheap Ryanair flights to Europe, frequently seems to believe that his cousin and her advisor Rainaldi may be scheming, or insane, or extravagant, simply because they are Italian. With the exception of the kindly servants who attend to him when he visits Italy, there is no room for manoeuvre in Philip's assumptions that Italians are, by their very nature, not only more sensual and hypnotic than the English, but also far more lax in morals of every kind. The role of women is also important. One of the central themes might be said to be property: the whole novel revolves around Philip's inheritance of the estate. 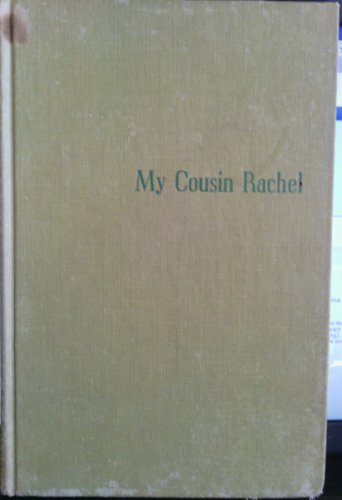 Throughout the book there are very few occasions when Rachel is referred to as anything but 'my cousin Rachel'; she has become an extension of the property Ambrose has transferred to his young ward. She is tied down and held hostage by the men in her life. With Ambrose's new will left unsigned in the cloud of doubt that surrounded his death, she is left with nothing but Philip's charity. Although a hugely independent character, she can never truly be independent while she must have the permission and goodwill of the men in control for everything she does. I read this book in a crazed frenzy. The pleasant country life described was full of tension due to the uncertainty related to various events as well as the narrator’s naïve, heedless feelings and decisions. There were similarities to du Maurier’s Rebecca – an enigmatic woman and a treasured estate are at the center of the plot. However, there was much more ambiguity surrounding the woman who sets off the events, Rachel. As in Rebecca, the author ends on a climax but less is resolved. The simple prose, focus on the natural surroundings and a refusal to admit feelings in a first person narrative create a good portrait of Philip, the narrator. du Maurier quickly sets up the events that lead to a clash between Rachel and Philip. Philip’s guardian Ambrose, an eternal bachelor who planned to leave the estate to him, travels to Italy for his health and meets and marries Rachel, a distant relative. While everyone in Cornwall is happy for him, Philip is annoyed. He already has hateful images of Rachel in his head when Ambrose sends him incoherent letters hinting that Rachel is trying to kill him. He rushes to Florence but Ambrose is already dead and Rachel is gone. Philip plans revenge against her until she suddenly shows up at his estate. It is perhaps not a spoiler to say that he falls in love with her but her feelings, thoughts and actions remain a mystery. The tension ratchets up as new information about Rachel trickles out and Philip remains blind to her bad qualities. Even the placid scenes depicted are interesting as you wonder if Rachel is sincere or manipulating Philip and everyone else. For example, several times he is suspicious of her, but she immediately detects the change, finds out what’s wrong and provides an explanation that satisfies him. A master manipulator, one might think. However, it’s entirely possible that the answers she provides are the truth. More tension comes from Philip’s rush to fall in love with her – like his godfather and friends, you want to tell him to slow down and see reason. He’s avoided the company of women all his life and plans to be a bachelor like Ambrose – could be why he has no intuition or emotional intelligence or whatever it’s called. The silences between them become deafening – pretty quickly on the reader realizes that Philip knows nothing about Rachel. Her background, her first marriage, her life with Ambrose – all this is ignored or put off because Rachel says it’s painful to talk about. Some people may think that Philip’s actions are rash and stupid and they are. However, he’s like a hormone-crazed teenager in love who thinks that no one has ever felt like this before and the more people try to slow him down, the faster he runs off a cliff. Daphne du Maurier’s My Cousin Rachel is a quiet, yet oddly feverish, book. Largely bereft of major incident, it makes up for its slow pace by means of its eerie atmosphere, psychological depth, and starkly luminous prose. While a comparison with Jane Austen is at the very least counterintuitive (in terms of style and subject matter, she is more closely aligned with the Brontës), I couldn’t help but think of the term “important nothings” when reading this book. In certain sections it seems so commonplace, so very normal, that when the ending comes one realizes with a shock, that all those details had been building to this all along. The narrator is Philip Ashley, a young man whose parents died when he was just a boy, and has grown up in the care of his older cousin Ambrose. Philip adores Ambrose, thinks the world of him, so when Ambrose, who is weathering the winter in Italy, sends word to him that he has married a distant relative of theirs named Rachel, Philip is struck with jealousy. But the marriage, which initially seemed so happy, turns sour, and Philip begins receiving frenzied notes from Ambrose, the last a mere scrawl: She has done for me at last, Rachel my torment. By the time he reaches Italy, Ambrose is dead, and Philip believes that Rachel is somehow to blame. There and then, he vows that she will pay for it. But when she comes to visit him in Cornwall, he too falls under the spell of her charms. Was he wrong about her? Or is he following the same path Ambrose trod, one that will end in death and ruin? If you are looking at things from a cold, critical point of view, it must be admitted that there are certain similarities between this novel and du Maurier’s most famous, the haunting Rebecca. But if you allow yourself to be drawn into the world of the story, you will see that it is its own entity. If the setting is similar, it is because it is one that du Maurier knew and was drawn to; if the characters are worked out of basic types, it is likewise true that du Maurier invests them with their own personalities and characteristics. One of the things that separates this from Rebecca, and may surprise new fans of the authoress, is the male narrator. Philip may be a rather sheltered and dependent young man (some would say effeminate even, and I can imagine that there are some interesting readings of his relationship with Ambrose), but he is still unmistakably a man in terms of his psychology. Du Maurier’s grasp of the male mind is so accurate that at times I found Philip reminding me—uncomfortably—of myself. Oh dear! Rachel herself is complex, haunted, sinister, a woman caught between two worlds, and lodging a passionate soul within her small frame. Whether she is guilty or not, I will not say. You must read to find out for yourself. And the ending, oh, the ending! Somehow it brings the book full circle, makes it complete, and yet ambiguous. I do not know exactly how du Maurier pulled it off, but she did. Six-word review: Dazzlingly confident display of storytelling finesse. Here's a virtuoso performance: an author who expertly manages her reader's perceptions through what's said--and how it's said--and what's left unsaid. I'd call this a doozy of a psychological thriller, one that had me going right from the first page. Deftly interlacing love and madness with doubt and delusion, du Maurier raises ambiguity to a fine art. Is Rachel what she seems or isn't she? And what, exactly, does she seem? Does she change, or is she the constant, the touchstone, the reality with which other experiences collide? Is the first-person speaker simply an unreliable narrator, trapped in assumptions and false conclusions, or are there layers to his ingenuousness? Whose suspicions are warranted? Whose is the voice of reason? If you don't find yourself going back and rethinking things after reaching the end--and more: if you saw it coming--then my hat's off to you. I'd say it was done with mirrors, but in fact it was done with consummate skill. I cannot believe that this book was originally published in 1951! I read Rebecca ages ago and loved it but I had never even heard of My Cousin Rachel until just a few months ago. I'm so glad I did. Did she or didn't she? That is the question that will keep readers on the edge of their seat until the final twist on the very last pages. Phillip Ashley was orphaned at a young age and raised in 19C Cornwall by his older cousin Ambrose. Health issues force Ambrose to spend time in warmer climates and he meets and marries a distant cousin Rachel, the widowed Countess Sangaletti. A cryptic note arrives from Ambrose hinting at being poisoned and Phillip heads to Florence to find Ambrose dead of a brain tumor (so the doctors say.....) and Rachel disappeared, with Rainaldi her close friend and "financial advisor" handling her affairs. Philip Ashley has always looked up to his older cousin Ambrose as almost a God figure. Ambrose, haven taken in his orphaned cousin when he was just a toddler, has raised him in his image in a male-only environment, where the company of women was only tolerated when absolutely necessary. Having no other dependents, Ambrose has long ago decided Philip is to be his heir. The two have almost never been apart, save when Philip went to school and university, but when he returns home the older cousin must travel to warmer climes for health reasons, and it is decided Philip must stay behind in Cornwall to look after the estate. While away in Florence, the impossible happens, Ambrose meets a woman, half English, half Italian and a distant relation and falls in love with her, and shortly after, marries her. But things quickly take a dramatic turn, and within eighteen months, Ambrose's health has suffered a terrible decline and his letters are more and more frenzied, even accusing his wife of poisoning him. Philip hurries off to Italy at Ambrose's request, but arrives there too late, Ambrose has just been burried and his cousin, Ambrose's wife Rachel, has packed all his things and left her villa and gone no one knows where. Discouraged and in deep grief, Philiip returns to Cornwall and to the estate he will come to inherit soon, on his 25th birthday. He has vowed to take his revenge upon Rachel, whom he imagines to be a horrid old crone. Until Rachel arrives in England, and Philip feels compelled to invite her to stay over so he can exact his revenge upon her. Of course, he could not have expected he would fall in love with Rachel too, petite and unassuming, despite his terrible suspicions. And after all, it doesn't seem quite right that Ambrose hasn't made any provisions for her in his last will and testament. This was a terrific page-turner and I felt compelled to read on to discover who this enigma that is Rachel really is. Is she an angel or a devil? Is she a little bit of both? Is she loving or calculating? Is she playing games? And what are Philip's real motives? Is he really Ambrose's clone as everyone else seems to think he is? This novel has all the suspense and taut atmosphere I loved in Rebecca, to which it has been compared to, only here we have a living woman to puzzle over as opposed to a mere ghost. All the same, she is impossible to pin down. Over the last few years I’ve been reading more of du Maurier’s work and coming to consider her a favorite writer. I’ve read Jamaica Inn, The House on the Strand, The Flight of the Falcon, The Scapegoat, Rebecca and Frenchman’s Creek, plus a collection of short stories. At some point I read a negative review of MCR that said it was basically a warmed-over Rebecca. What? Did we read the same book? MCR is most assuredly NOT a warmed-over Rebecca. It’s a deliberately-crafted psychological thriller dripping with atmosphere. So that’s my first instance of idiocy over MCR. There is another. While reading I took notes about Rachel’s character and how if she’s playing a game, she’s playing it awfully close to the vest. There was nothing overtly furtive or misleading in her actions and so I wondered just how du Maurier would check this up with whatever she wrote as the denouement. I had suspicions of a weak ending that just wouldn’t jibe and some behavior or action would seem out of the blue. I should have known to trust du Maurier and that the way she wrote Rachel would serve a purpose. Only at the very end, literally the last few pages, is the brilliance of the subdued portrait of Rachel, made clear. Like any good novelist, du Maurier gives us bits of foreshadowing that work really well to set tension. What did R spend her allowance on and why is she so overdrawn at the bank? The incident with the pearls and how poor, backward Philip couldn’t see their significance. Ambrose’s mysterious letters (which all get destroyed in one way or another) and what they really mean. The similar illnesses that befall both Ambrose and Philip. The way the staff, previously unsympathetic to R, start calling her the mistress. Just what are R & Rainaldi talking about in their whispered conversations in Italian? So much to savor and wonder about. Interspersed with these cryptic moments are Philips completely stupid inner monologues, lies and disastrous decisions. Monumentally disastrous decisions. As a character he’s the strongest. Sheltered, backward and almost completely ignorant of women he falls under a spell with regard to Rachel. I can’t really say whether the spell is hers in the sense that she has cast it and that’s one of the glorious ambiguities you will be left with at the end. If R was deliberately ensnaring poor, sappy Philip, she did it with such subtlety that as readers we don’t really know if it was deliberate. Philip is a perfect mark if it is a con, he’s so sheltered and ignorant that it wouldn’t have been hard to convince him to part with his fortune, estate and legacy. Like a little kid who is anxious to show how grown up he is, Philip is always declaring that he is a man, master of his estate and has reached the ripe old age of nearly five and twenty. He even laments the loss of his beard that grows during his illness because it made him look older. He’s pathetic and I didn’t have a lot of sympathy if she did screw him out of his estate. He had good advice and warnings about R, but ignored all of them thinking he knew better. Oh and he is quite the liar when he needs to be. Rachel’s personality is much more shrouded. She’s so opaque and enigmatic that I initially counted this as a flaw in the novel. I wanted her actions and motivations to be more clear. This was because I expected a definitive ending falling on one side or the other; was R guilty or innocent? An ambiguous ending didn’t occur to me simply because in many gothic novels the ending is solid. I should have prepared myself for ambiguity. The ending is pitch perfect and the way it’s foreshadowed fills you with dread and foreboding. The bridge in the garden is clearly the means and we (well at least I) want her to fall victim to it. By this time with the seeds in the drawer and her coldness and control of the money, we want her dead and Philip restored to his prior existence. Then there is the letter. The letter that spooked Philip, but that he couldn’t subvert and prevent its delivery. And the note about returning the Ashley family jewels to the bank so that Philip can inherit them like he would if he hadn’t foolishly given them to R. Oh how quickly our feelings change and we want him to catch up with her on the bridge and save her. In our heart of hearts though, we know this story cannot have a happy ending. That much has already been made clear by du Maurier’s narrative framing; Philip relates this incident from the distant future, his life a shell of its former happiness and contentment. The way he talks about how they used to hang murderers at the crossroads. No, this story cannot end well and it doesn’t. Philip was raised in a house of men never having any women in the house .He has never been around anything but farm wives and that has left him ill-prepared when his cousin’s widow comes to live with him. She is a woman of the world and wraps the poor naïve boy around her little finger without him even noticing. Although I’m still not sure if there is a villain in the story Rachel seems sweet and at most times without malice and Philip acts like a petulant boy most of the time. The letters from Ambrose are somewhat obtuse and as a reader I was never sure what had really happened to him in Florence. The ending of the story was abrupt and left many unanswered questions. Orphaned as a young boy, little Phillip was taken into the care of his older cousin Ambrose and goes to live with him on Ambrose's estate. They are content, the two bachelors, for some 20 years, young Phillip learning how to manage the estate he will one day inherit. That is until, Ambrose, then in his forties and suffering from bad rheumatism in the cold, wet winters of Cornwall, decides that he will spend some time in the warmer climate of the Mediterranean and leave the management of the estate in Phillip's capable hands. He writes and stays in touch, telling of his travels, and then, out of the blue, tells of meeting a woman, a half English, half Italian widow in Italy. They share a love of gardening and, in fact, she is a very distant relative....their 'cousin' Rachel. Before Phillip really knows what to make of this new friendship, Ambrose writes from Naples that he and Rachel are married and on their honeymoon. Phillip is not thrilled with the news, jealous of sharing Ambrose's affection and wondering how it will upset his future, but in a matter of months things turn even worse when he receives several letters from his cousin, very different in tone from his earlier ones professing his love for Rachel. Now he claims that Rachel is trying to kill him, poison him and Phillips set out at once for Florence, where the married couple are living, to come to Ambrose's aid. But he is too late, arriving at Rachel's empty villa to find out that his cousin has died, supposedly of a brain tumor and the widow is gone. Phillip is convinced that Rachel has killed his cousin and pictures her as an evil, scheming witch. That is until a short time later, he receives a letter from the widow that she is in England and wishes to come to the estate to return Ambrose's possessions. She arrives and is, of course, nothing as her pictured her. Before he known what is happening, he finds himself being rather bewitched himself by his lovely cousin Rachel. What are her intention and is she an innocent widow, or a scheming murderer...yes, that is the question, and Ms. du Maurier will keep you guessing until the very end. No humor here, no dashing adventure. No, this is a a real psychological thriller, darker and more sinister, certainly less clear cut. It is not so much what happens in the story that creates that sinister feeling, but the way du Maurier is able to skillfully paint the characters, especially Rachel. The story is full of questions, tossing us back and forth in our opinion of Rachel. Listened on audio 2009. Sensual, intelligent and chilling. When Rachel arrives in England, Philip's instinct gradually ebbs away and his feelings deepen from fascination to obsession. It appears that history is about to repeat itself, with Philip falling her under her spell just as Ambrose before him…… but, who is Rachel ultimately? Is she the sweet, charming, playful and mischievous woman driven by emotion that Philip falls passionately in love with? Or is she the cold, manipulative woman others think her to be, out for financial gain and a murderess to boot? In this heart-wrenching tale of love, longing and tragedy, the plot is intelligently structured with an intimate portrayal of the characters leading to the final twist. At the close of the novel, when Philip becomes responsible for her death, all expectations are reversed and the reader is left to question whether Rachel was good, mad, bad or indifferent and who was right, or wrong? Daphne Du Maurier lives and breathes her characters, taking the reader under their skin to produce a novel that is bleak, brooding, lush and chilling. The novel works around the notion that love is blind and explores perception, deception, individual and collective reality. Why, why, why did I wait so long to read this book??? My Cousin Rachel blew me out of the water in its' greatness and left me wondering why I hadn't read it sooner! It is the story of Phillip Ashley and how his entire world changes when Rachel comes into his life. Rachel is the widow of his beloved Uncle Ambrose who is recently deceased. Everything Phillip has ever known changes when his cousin Rachel arrives.....and his life will never be the same. This is basically going to be a gush fest so be prepared. I adored this book. Just adored it! The atmosphere and underlying tension in this book was just amazing. It had me well and truly hooked as I was reading. My Cousin Rachel has this creepy feeling to it where you know something bad is going to happen and all you can do is wait for it. This feeling made the atmosphere of the book so creepy and intense. I just couldn't put the book down! (And I'll admit to peeking at the ending when I was almost finished because I couldn't take it any longer. I had to know. And it still didn't take away from my enjoyment of the novel.) Rachel and Phillip are on this destructive path together that neither of them realizes, and all the reader can do is wait for it to happen. Even then knowing that there couldn't possibly be a happy ending to the story, I was blown away by the ending. It left me thinking, and I had to go back and reread the first chapter again. And then the ending again. And I was still left wanting to discuss this one with someone. It was just that good! I don't think I need to even summarize my feelings on this one. I LOVED it, plain and simple! I would reread it again without a second thought and want a copy of it for my own shelves. Just thinking about it now makes me want to read it again so what can I do but recommend it to all of you! Highly recommended!!! Bottom Line: An amazing read.....nothing more to say other than that! My Cousin Rachel is a great suspense novel - I think it is even better than du Maurier's Rebecca. Unlike Rebecca, this is a historical fiction set in mid-nineteenth century Cornwall. Although du Maurier never specifies the exact date, she leaves clues which set the timeframe (such as the opening scene of the book, in which Philip Ashley describes seeing the body of a criminal hanging at a crossroads when he was 7). I believe that this absence of dates was deliberately done to add to the timeless feeling of the psychological drama which plays out. It would be impossible not to compare this novel with 'Rebecca', considering the similarities of the eponymous characters and what happens to them, but I'm not sure I can say that 'My Cousin Rachel' is in any way inferior. The unnamed narrator and the descriptions of Manderley in 'Rebecca' make that book my favourite out of the two, but both novels are well crafted and suspenseful. Du Maurier has a definite talent for writing unrealiable, or prejudiced, narrators, whose paranoia both repels and influences the reader's perspective. The narrator here has a name, Philip Ashley, but he is also an orphan, raised in eccentric indulgence by his cousin Ambrose. Spoiled and immature for his age, Philip is just as insular as the second Mrs de Winter, and lives only for his guardian and their estate in Cornwall, which he will inherit on Ambrose's death. His sheltered existence is disrupted, however, when Ambrose goes abroad for the winter, to Florence, and meets and marries a distant relation, 'my cousin' Rachel. Philip's imagination is wracked with fears about this interloper, but his anxieties are cruelly realised when Ambrose dies suddenly abroad, after claiming in a scrawled and urgent letter than Rachel, 'his torment', has 'done for him'. Has Rachel killed her husband of one year for his estate, or is the cause of Ambrose's death a hereditary brain disease? Philip's suspicions of his cousin are dispelled when she visits Cornwall and charms everyone with her wit and warmth. Like Rebecca, Rachel is attractive and popular but with a dark secret, which only Philip is aware of. He struggles with his infatuation for her, playing directly into her plans in a bid to win her for himself, but is forced to face the truth - or his understanding of it. This novel pales in comparison to Rebecca. If you can get beyond that, it is well written and suspenseful and stands on its own. The final chapters made the the short interludes where it was a little slow worthwhile. Phillip Ashley idolizes his cousin Ambrose having been raised by him on Ambrose's Cornish estate. When Ambrose goes to Italy, meets and falls in love with Rachel, the widow of an Italian nobleman, then marries her; Phillip is extremely happy for his cousin. As time goes by, Ambrose becomes deathly ill and suspicion falls on Rachel as being the cause of his illness. This reminded me a bit of Rebecca, with the same kind of setting and atmosphere. Philip and Ambrose are bachelor cousins living on Ambrose's estate. But Ambrose has some health problems and so has been spending the cold winters abroad in sunnier weather. Ambrose has been Philip's guardian since he was a boy and has never been married. So Philip is quite shocked when he receives a letter from Ambrose in Italy and the news that he has married the widow Rachel. Philip keeps waiting for Ambrose to return home with his new bride but Ambrose writes of affairs that must be settled first. Then he begins to write more disturbing letters that cast doubt on Rachel. Philip fears for Ambrose's safety and journeys to Italy to bring him home. sadly he discovers that Ambrose has died of a brain tumor. Philip returns home filled with anger at the Rachel he has never met. but when she comes to England, she is nothing like Philip expected and he begins to develop feelings for her. I love a good suspense novel where my opinion of the characters keep changing and wondering who, if anyone is the guilty party and this one did just that. If you enjoyed Rebecca, you will enjoy this as well.